Impressive and useful info, thank you a very big lot for this series. By reading this now i’m thinking that for general photography one might be much better to focus at 1/2 BAF distance from center. Center still very sharp, extends the sharp area less than full BAF, but still a good amount. 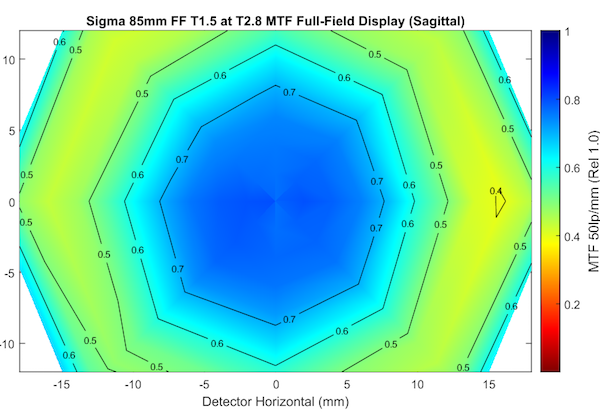 I’m thinking this can be done (with phase detect) by micro-focus adjustment. 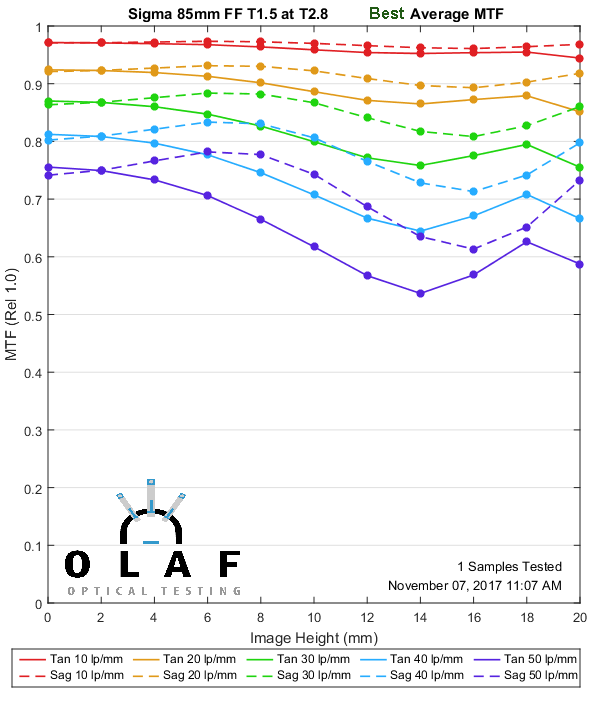 Do you know if there is any correlation between the adjustment values provided by the manufacturers in camera for adjusting (those +/-N things) and actual focus values (from the MFT vs Field vs Focus graphs)? It would differ for different lenses. The more interesting (to me) part is that depth of field is narrower as frequency increases. 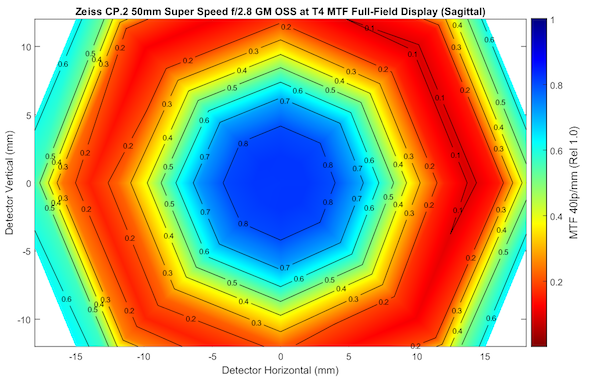 So it’s easy to get depth of field at 10 or 20 lp/mm that covers the whole field. But at 50 (fine detail) it’s not happening ever. So you can get a nice contrasty look over the whole image, but you can’t simply use depth of field to pick up fine detail on a high-resolution sensor. Someone actually loaned me one of those a while back to test. It was fascinating you could definitely change the shape of the field very easily. I don’t think I kept the files, I sent them to the person who asked me to test it. We are testing focus shift going forward. It occurs everywhere, although some lenses it might be more significant at closer focusing. Poorly worded indeed. I’ll try to get that more specific sometime today. unfortunately my nikkor Ai 85mmf2 is missing in your list! very valuable information since i actually shoot flat things a lot! thank you so very much! This is interesting however I am wondering how it interacts with the accuracy of focus points. I assume contrast-detect focusing will be accurate, if slow, across the frame. But there must be a reason why the centre point is usually given all the bells and whistles wrt phase-detect focus ability. And in some DSLRs, the grid of PD focus points only fills the centre third. So would it be wise to use one of those outward focus points if it wasn’t actually as accurate? Are you planning to look at focus shift? From what I understand, it is more of a problem with closer focusing, and you always seem to test at infinity. 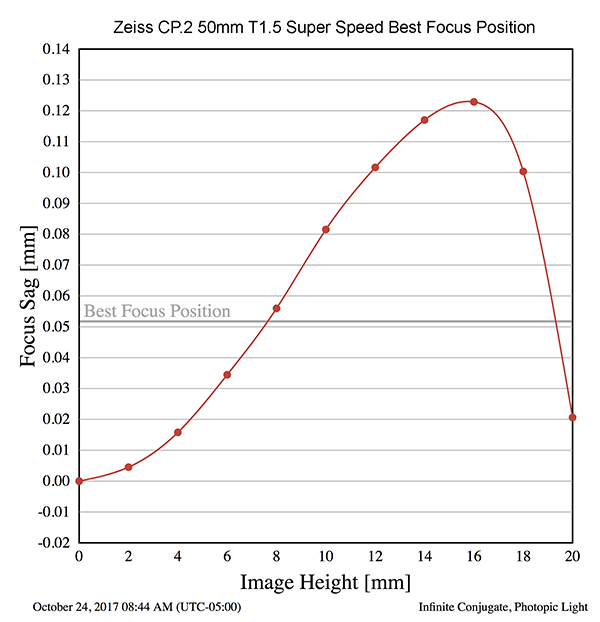 I was just thinking how this testing backed up my high opinion of the Zeiss 21mm, with it’s score of 14 being close to the best! Wow, now thats an interesting lens! Tis all good for thought. Luv ya work! MTF and field curvature are not two different things. “deconvolving” (this is not the correct process) the two does not give you a distinct “BAF” and “focus curvature.” BIF + focal surface sag would separate the two. In your wedding photo example, if you arrange the people along a curve, the photo will probably look weird, compositionally. We are accustomed to a flat line. 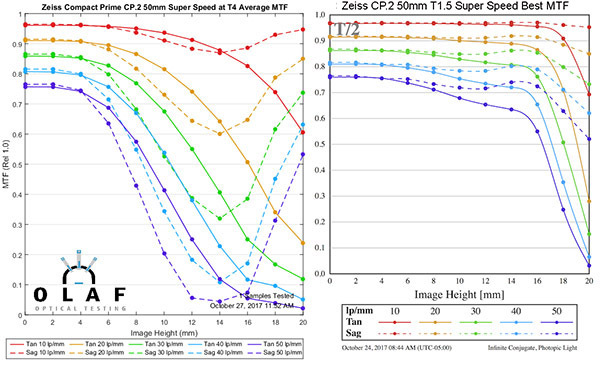 So MTF and Focus Curvature are two different things, but the ubiquitous MTF lens charts we see are always a mixture of MTF & Focus Curvature? What if you deconvolve the MTF from the focus curvature into a “BAF” measure, and a Focus Curvature measure. Internet lens measure-bating does seem to put an inordinate amount of importance on high-resolution lenses with flat fields for taking pictures of newspapers taped to the wall. I guess if we know the the lens has forward curving focus, we could ask the wedding party edges to move in a bit so everybody would be in focus. In landscape you are screwed every which way (fore-, mid- and back-ground) unless you get a tilt shift lens or focus stack. But it might be useful to know how screwed you are. Just T and S are not enough to produce a good measure of “resolving power” across the frame and determine the shape of the best focus region. You can average the two, but it is not a very good way of doing it. If we had, say, 36 azimuths in MTF-space, it would be enough. 2 is insufficient. 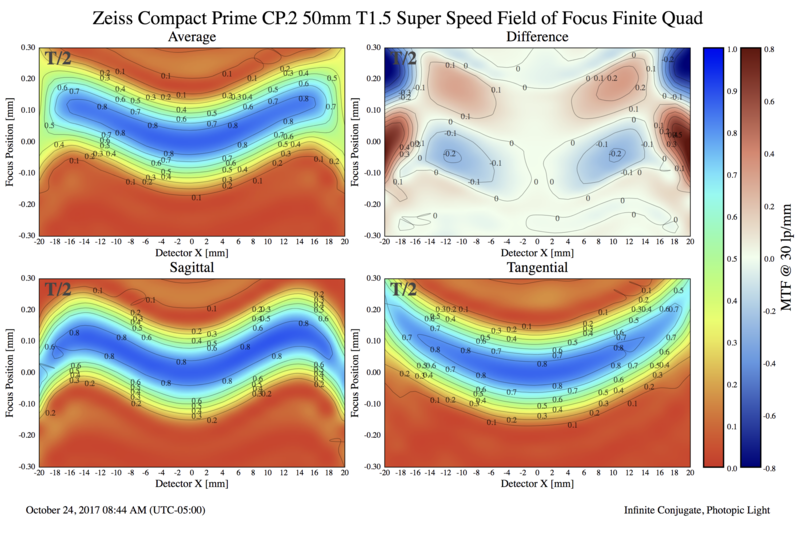 If you can combine T and S information in a principled way, can you then combine them in a joint MTF v Field v Focus curve? That, to me, would be interesting, because you could read off both resolving power across the image and also the shape of the best-focus region, which would provide the same kind of information about where to focus. The VLOR is determined from a combination of T and S information, neither one in isolation. 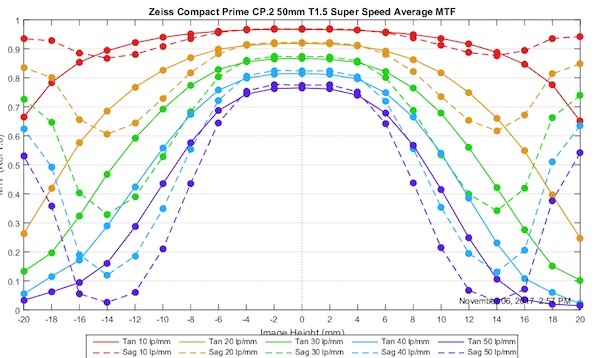 We could make it a trust-region like algorithm where it chooses to ignore some field points if they cannot be made to be sharp, but this would substantially raise the computation cost from something that can be done within 5ms via array operations to something that can be done in potentially minute(s) with a smart nonlinear optimizer. 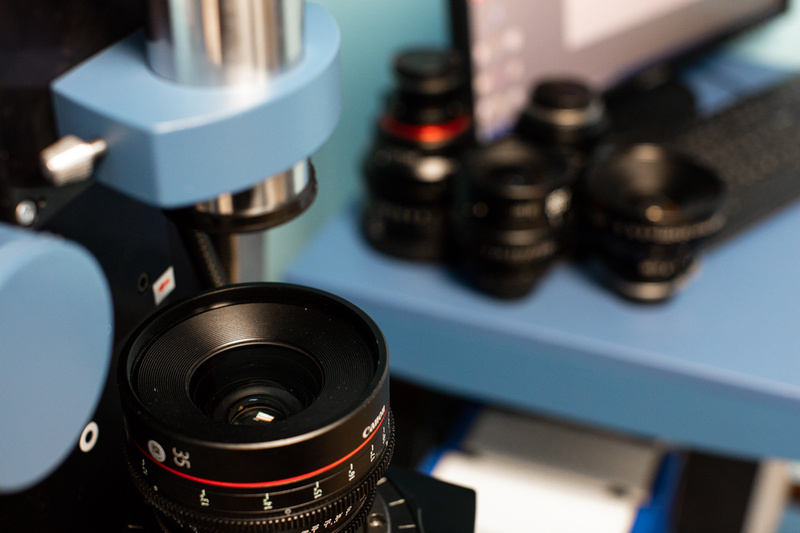 Most lenses are not so extremely astigmatic that the difference is substantial, too. I guess I am back to the same questions that I had on the last post. I love the idea here, but I’m not sure it is quite telling us what we might want (if any number ever could…). 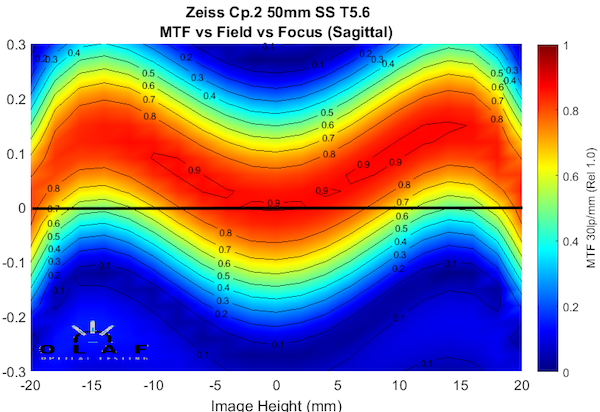 What would happen if you repeated the process for the Zeiss using the tan instead of the sag? Looking at the relationship between the best focus and the field graph, instead of going down on the right the tan graph keeps going up. 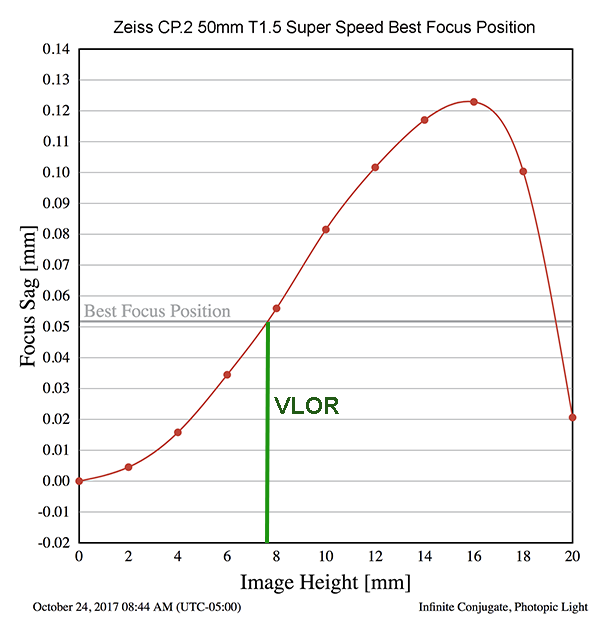 Which means that when you minimize the area under the graph, the vlor will be pulled to the right.. And if you followed the advice it gives, you would move your focal point further to edge of the frame. And that might be the right thing to do, practically, but it does seem (1) you are moving it to improve focus in an area (the edge) where the tan MTF isn’t very good anyway and (2) you are moving it to a point where tan and sag are fighting each other, because the field graph for each is moving in opposite directions. I completely support the overall idea, and I am sure this number is very useful and a vast improvement over what we have. But I have a niggling feeling that there is a parameter that is missing that can’t really be left out. 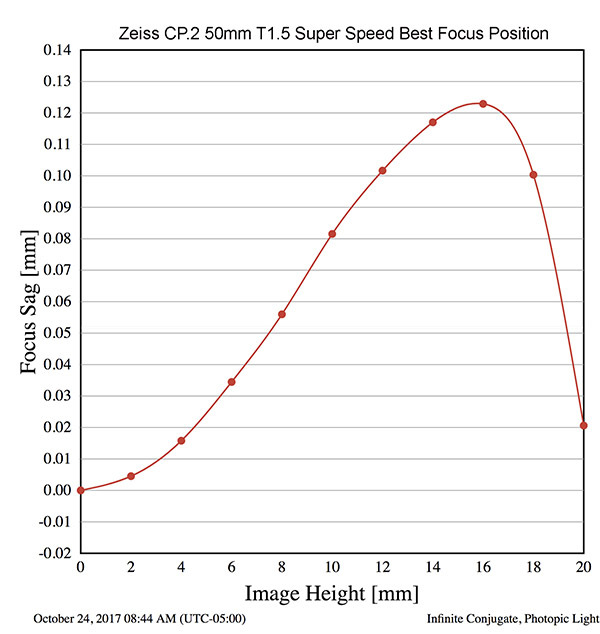 It seems to me that the question “where should I focus to maximize my amount of in-focus” is exactly the right question, and that the answer is “not the center” is really important. But if we want to mathematicize (!) it, then we have to answer the question “how good a focus do I demand?” before we can answer the first question. Because otherwise we could end up focusing in a way which gets us the best (compromise) focus at the edges, but where the level of resolving at those edges is not acceptable anyway, and we have lost the best (compromise) middle. In other words, vlor will be pulled to the left, and further to the left the worse (in terms of curvature) the edges are. Again, I’m ignorant and don’t know what I am talking about. But I am imagining the following decision tree: I want to resolve to at least X. Well, turns out that my lens will resolve to X only to 12mm across the sensor. Now, where should I focus so as to maximize my X resolution? Thank you very much for this. 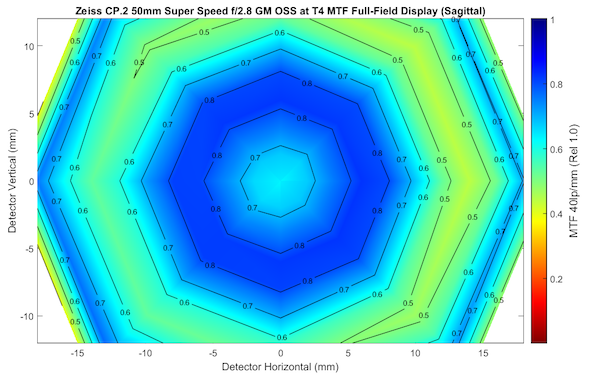 I can easily see how to apply the BAF position to images of 2-dimensional subjects. Three-dimensional scenes seem more problematic. Do you move your focusing point to the BAF position, use that to focus on the most important part of the scene, and then recompose? Or, as you say, do you focus on the 3rd lady from center, and not recompose? Do those two methods yield different results? It seems to me it will depend on whether the 3rd lady is in the same plane as the center lady. 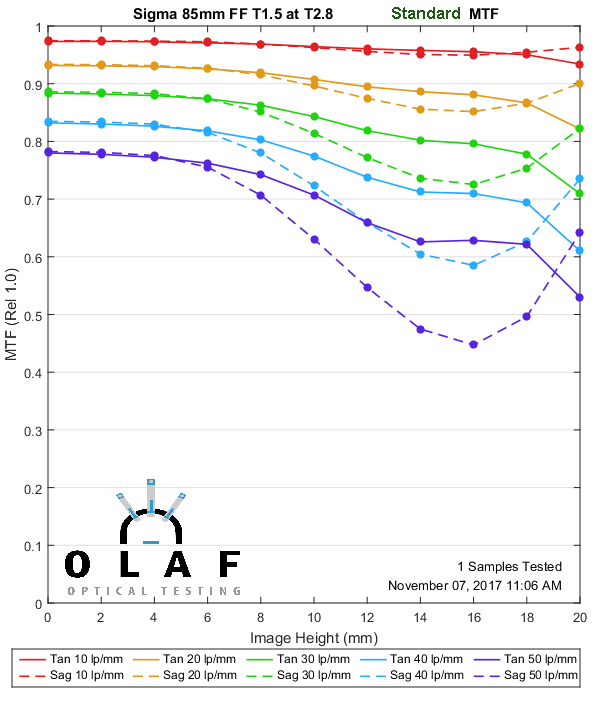 For future tests, I would really like to know the BAF position (wide-open and at, say, f/4 or f/5.6 of course :-), unless aperture has no appreciable effect on BAF). It would also be good to have some idea of the cost in lost center sharpness, and the benefit in increased edge/corner sharpness. These can be seen easily enough in the graphics. 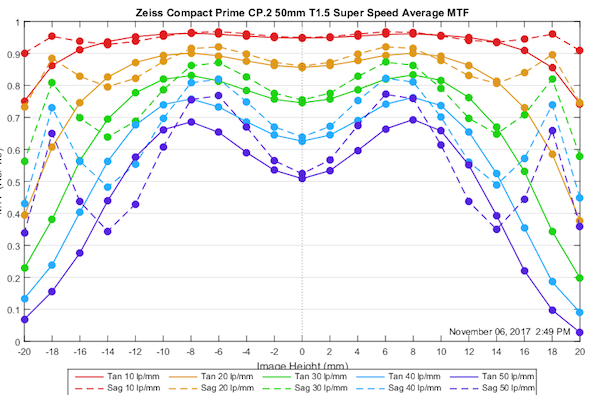 ps: are you going to measure the zeiss milvus 35mm 1.4? Andre, we’ll definitely be including MTFvFvF charts in our tests going forward. If you knew that’s where you always wanted to focus you could do it. Kind of like a lot of people walk around with their lens set at hyperfocal distance (granted there’s tons of argument about where that is). Then, would it be advantageous to incorporate your BAF point in setting AF fine tuning on those camera which offer the function? This is awesome, and I’m glad you guys are exploring MTF in ways that haven’t (publicly) been done. I think an MTF-vs-focus-vs-field chart would be very useful already since we could guesstimate the BAF point from it. 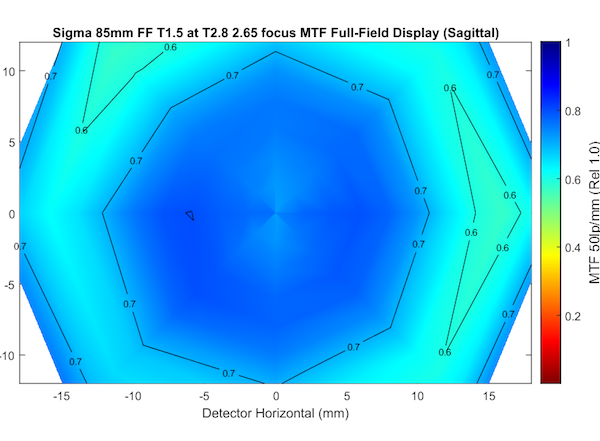 It would be useful for finding other ways to optimize the focus if absolute MTF wasn’t the goal, like if you wanted to find a point where astigmatism is minimized, or if you cared more about MTF in one direction than the other. Phil it is at infinity focus and with modern, non-macro lenses it should be accurate until at least right near minimum focusing distances. Thanks for this fascinating series of posts! One question… this is measured at infinity focus right? Any idea whether the BAF is likely to be a function of focus distance?